Facebook has added new element “Trending Articles” to the default news feed of your Facebook account. It is a small box containing news articles (and sponsored articles). Box is displayed in the top half of the news feed and you can slide through listing of various news articles within the box. Fortunately, this ‘trending articles’ box only appear sometimes at random. Few users may not like this new addition to already over-loaded news feed and want to hide or remove this. As seen in screenshot below, Trending Articles box is displayed prominently on your Facebook news feed. It usually display 2-3 articles which can be navigated through right and left arrow button located at top right part of the box. Displayed articles are selected by Facebook and usually contain news articles shared (and read) by your Facebook friends mixed with few sponsored stories. 1. 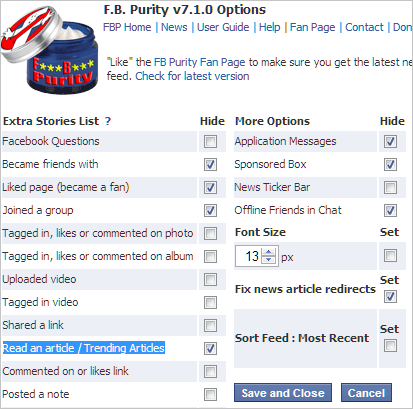 Use FB Purity – FB Purity is a popular addon to customize various features and bring sanity to the default Facebook news feed. Best part, it is available for majority of popular web browsers including Google Chrome, Firefox, Opera, Safari. Just open fbpurity.com website to get started. 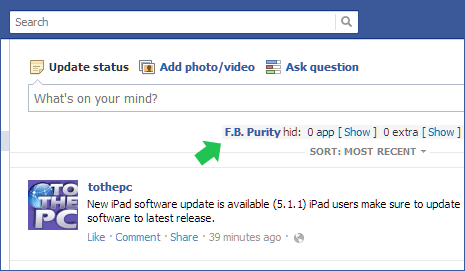 For example: Google Chrome users can install FB Purity extension and then open their Facebook news feed page. Click on FB Purity link at the top part of news feed to open settings box. Then click to check Hide option next to “Read an article / Trending Articles” option and then click ‘save and close’ button at the bottom. From now on, Trending Articles box will not appear in your Facebook news feed. 2. Use Userstyles script – FB Purity allows you to customize various features of Facebook profile display. If you only want to hide trending articles box, then you may use remove trending articles userstyle script for only removing the trending articles box. You can open this userstyle script link in either Google Chrome or Firefox browser and install respective plugin or extension for using this userstyles script. The latest version of FB Purity (v7.5.1) now also allows hiding the Trending Videos. Just tick The hide trending articles option and it will also hide Trending videos.